As follow up of Decision 37 COM 10A adopted by the World Heritage Committee at its 37th session (Phnom Penh, 2013) and based on the results of the 2nd cycle of the Periodic Reporting exercise, the Latin American and the Caribbean (LAC) States Parties, in close cooperation with the World Heritage Centre (WHC), the Advisory Bodies and Category 2 Centres started working on the development of regional and subregional action plans. A regional meeting was held in Brasilia from 23 to 25 April 2014 with the support of the Brazilian government through the National Institute for Historic and Artistic Heritage (IPHAN) for the development of the Regional Action Plan. The Action Plan is structured around the strategic objectives for the implementation of the Convention, synthesized in the Budapest Declaration on World Heritage (adopted in 2002), which were reaffirmed and finalised in 2007 ("fifth C"). The Plan provides challenges identified in one or more sub-regions of Latin America and the Caribbean, considered as regional priority issues by the States Parties: (i) Education, communication and information; (ii) Integrated heritage management; (iii) Sustainable tourism in World Heritage sites and (iv) Categories of Heritage: Urban Heritage, natural sites and Cultural Landscapes and Archaeological Heritage. At its 38th session (Doha, 2014), the Committee adopted the Action Plan 2014-2024 and requested the States Parties to continue working on the development of sub-regional action plans (Decision 38 COM 10B.4). Furthermore, the Committee also called upon other regions to support the efforts of the LAC Region in implementing the Action Plan, in the spirit of the international cooperation promoted by the World Heritage Convention. A sub-regional meeting was held in Havana (Cuba) from 26 to 28 November 2014 with the financial support of the Netherlands Funds-in-Trust at the World Heritage Centre for the development of the Caribbean Action Plan . The Action Plan presents an operational framework to facilitate the implementation of the PARALC in the specific context of the Caribbean. It also enriches and gives follow-up to the Kingston Action Plan adopted in 2013, and proposes an updated Caribbean Capacity Building Programme for World Heritage. The elaboration of the Plan was underpinned by the identification of the following sub-regional priorities: (i) Conservation and management; (ii) Nominations and tentative lists; (iii) Effects of climate change and risk management; (iv) Community participation; (v) Sustainable Tourism; (vi) Capacity Building and (vii) Networks and partnerships. The PAAS 2015-2020 builds upon the PARALC; the answers received during the process of the Periodic Reporting for South American countries; and the State of Conservation Reports evaluated by the Committee in recent years. The Plan constitutes a prioritised sub-regional action framework that was agreed upon and approved by the States Parties of South America as a common working agenda. The PAMAC 2018-2023 reflects the main priorities and opportunities for strengthening World Heritage agreed upon by the seven States Parties in the sub-region, and sets out an ambitious common agenda of work to implement at the national level and through opportunities for sub-regional cooperation. 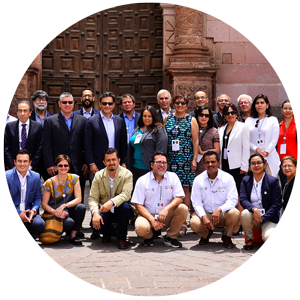 The PAMAC builds upon the regional Action Plan for Latin America and the Caribbean (PARALC 2014-2024), the answers received during the process of the Periodic Reporting for Mexico and Central American countries, and the State of Conservation reports evaluated by the Committee in recent years. The Plan contains three major components: (i) Action Plan for World Heritage (PAMAC), (ii) Capacity Building Strategy (EFCAMAC) and (iii) Program of Pilot Projects (PPPMAC).